Here I am again asking for more guest posts. This time, it will be on something everyone can relate to: What makes the area you live in special? C’mon people, let me hear from you! I want to get to know my readers! Email Jennifer@makobiscribe.com with at least a 200 word post with a picture, and you can be my next feature. It will include links back to your site, so you can get more visitors! I live in sunshiny Southwest Florida. When I say sunshiny, I mean SUNshiny! I have been sitting in my AC for about a month now and my electric bill has already gone up $40! It is hot! It is kind of funny because my husband has been driving around in snow up north. I live relatively close to the beaches, and our family tries to take a “staycation” there every year. It is pretty reasonable because we go in the height of the summer when only locals are crazy enough to withstand the UV rays. Awesome! I just looked up the UV index for my zip code, and it is and 11+, the highest it can go. I really need to get a new pair of women’s sunglasses before our vacation this year. While browsing as I do on the net I came across Misterspex which has the unique feature of allowing you to upload your picture to the website to “try” on the sunglasses before you buy. I love applications like that. No need to wrestle with two toddlers at the store. In addition to the lovely sun and sandy beaches, we have lizards, alligators, and mosquitos. Right now the air is super thick with love bugs, and in a few months the air will be buzzing with cicadas and love bugs. Sound like paradise? It really is if you are a mom of three boys who thinks all those things are super cool. We even have a few streets in my town that have panther crossing signs! 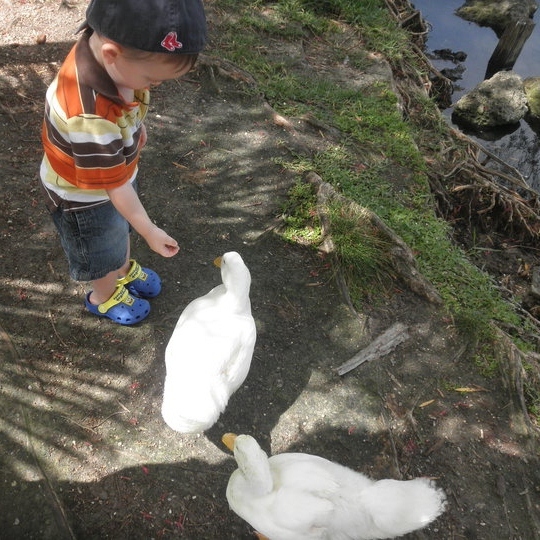 As if there was not enough wildlife to see outside naturally, we can visit animals at the Naples Zoo, Miami Zoo, or the more local Shell Factory. My husband took this picture from one of our excursions to the Shell Factory. The ducks are super friendly when you have food, almost too friendly. Another fantastic bonus to living in my area is the thrilling theme parks! I live within hours of Universal Studios, Busch Gardens, and the theme parks where Noah and I spent our honeymoon–Walt Disney World, Sea World, and Epcot. That is another post! If you live in Florida, you qualify for the Florida resident discount and more often than not, you can get in almost free. Where do you live? What makes it special? Send me your posts! Are You A Small Business Owner? I Can Help.